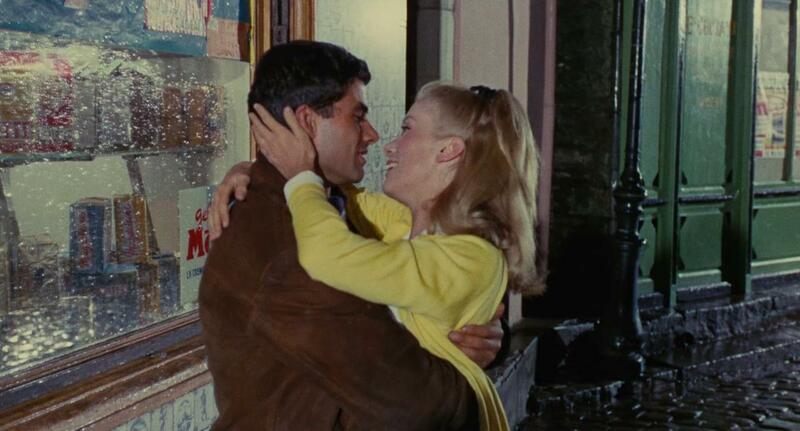 Jacques Demy’s The Umbrellas of Cherbourg is a coming of age film as much as it is a love story. It tells the story of Genevieve (Catherine Deneuve) and Guy (Nino Castelnuovo) as they combat the march of time and come to grips with the cold reality that obstructs their youthful romance. Demy was one of the great filmmakers of the French New Wave, but The Umbrellas of Cherbourg is his most interesting and influential work. Performed entirely in song, the operatic film gets to the core of its characters’ emotions through melody. The music was composed by iconic composer Michel Legrand who collaborated with Demy on several other projects. The nature of the constant singing has a peculiar lulling effect. It grips the viewer where one might think it alienating, and where one who isn’t fond of musicals might expect the effect to be grating, it proves warm and welcoming. This feeling is promoted by the lush color of the film whose palette has been one element that has resonated to the films and filmmakers influenced by The Umbrellas of Cherbourg. The story itself is separated into segments marked by the changing seasons. We meet Guy and Genevieve when they are in the midst of the sort of passionate, youthful love that can only be understood when one is totally free of the understanding of life’s challenges. They are entirely isolated in each others’ love. When Guy is called into military service, the pair have to part, at which point Genevieve learns that she is pregnant and meets a kind and well off man named Roland Cassard (Marc Michel), a recurring character from Demy’s Lola who offers the sort of security that Genevieve’s mother views as the cornerstone of a successful marriage. In the third segment, Guy returns from war to find that his love has married Cassard, and he must learn to cope with a world that no longer feels familiar. Watching the evolution and deterioration of this relationship never fails to draw me in. Though I know in each viewing where Guy and Genevieve are headed, the heartfelt passion of the film’s first act leaves me rooting for them despite my knowledge. Perhaps this is what Demy intended. We find ourselves watching The Umbrellas of Cherbourg, knowing full well that the end result of passion is often heartbreak, but we continue to revisit the film, seeking the warmth that we know we might be able to find if we just keep watching.The final scene of The Umbrellas of Cherbourg is a masterwork in emotive filmmaking. Meeting again at a snowy gas station, each of the former lovers gets to see what their life might have been had they found a way to stay together. Neither has failed to find a happy life, but they can’t help but long, in part, for the lost idealism of their youth. In each other they see the perfect love that they knew once for a fleeting moment, and they yearn for a feeling they can no longer experience.